If you're on a pay-as-you-go scheme for your broadband, you really want to know how much you're using - and how quickly. 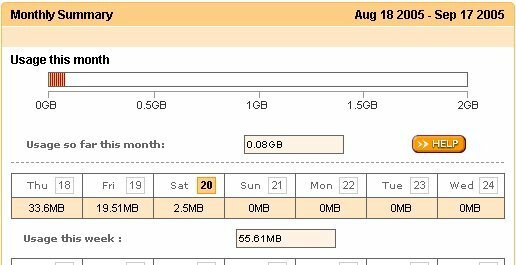 The interface that Plus-net provides isn't fantastic (it doesn't predict your requirements for the month, for example), but clearly shows you how much you've used out of your quota. These charts are for our own connection. See how consistent the monthly usage is? It's never gone above 2GB in a month. If you're considering signing up to broadband and don't know how much bandwidth you might need, 2GB might be a good starting point.